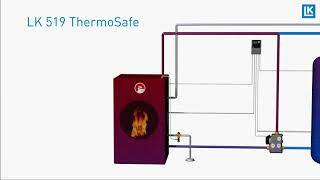 LK 519 ThermoSafe is a thermal safety valve for solid fuel boilers with built-in water heaters or cooling coils. The safety valve prevents the temperature of the ­boiler water from rising above the boiling point. When temperature levels are too high the valve opens to let cold water flow through water heater or cooling coil, thus ­reducing the temperature of the boiler. LK 519 ­ThermoSafe has two, separately functioning, temperature sensors for added safety. LK 519 ThermoSafe safety valve is installed on the outlet pipe of water heaters. The inlet pipe is ­recommended for cooling coils as such an installation would protect the armature from impurities caused by lime scale and other deposits. The arrow on the valve housing indicates the ­direction of the flow. The sensor pocket is screwed into the designated connection on the boiler. It is easier to install if the sensors are first removed from the pocket.